This HOLI RECIPE is for those wonderful people who strive hard to strike the perfect balance between home and work. Even as they excel on their work front, they leave no stone un-turned to make their home a haven of love and happiness. Being in the same shoes as these lovely beings, I can very well relate to the mammoth effort that is put to give equal weightage to both, to give 100% professionally while never missing an opportunity to add that extra magic to make your loved ones feel special. With the festival of Holi just round the corner I came across this recipe and knew at once that this would be perfect for all of us who are planning to host a Holi Party but have time constraints at the same time. We want our party to be applauded and remembered but have deadlines to meet at office too. Therefore the Instant Bread Dahi Vada / Bhalla is just the dish to make this Holi for us busy bees. This can be made from scratch in straight 30 minutes or even less (if you have nimble fingers) and take my words, becomes the star dish at your party. Visually very inviting and appetizing, this gets wiped off no sooner than it is placed on the party food table. Kids too love these little bites lapped up in yogurt with chutney's and pomegranate arils drizzled on top. Simply yum. For my dear friends and readers, those who are not familiar with Indian cuisine Dahi Vada are deep fried lentil patties or balls which are soaked in flavored yogurt after frying and served after drizzing them with chutneys, pomegranate arils, chaat masala and roasted cumin and chilli powder. 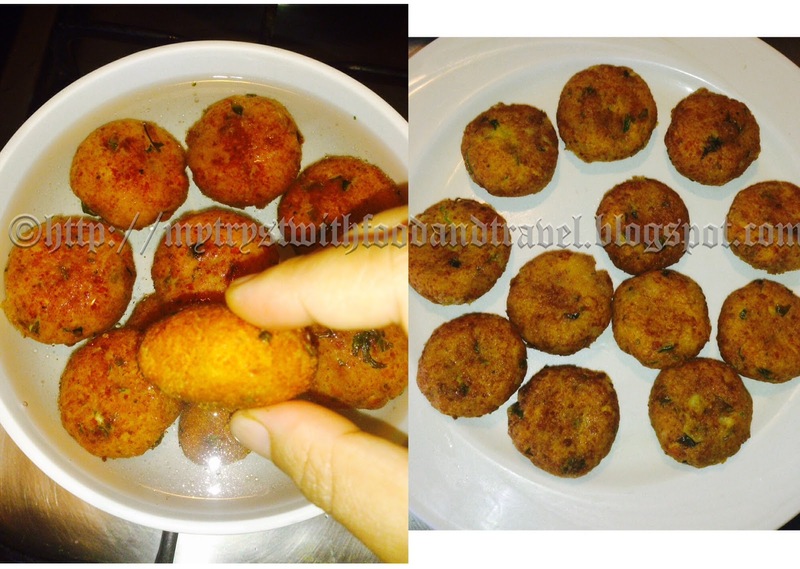 5) 3-4 Tbsp Oil to fry the VADAS in. Remove the brown edges from the White bread by chopping them off with a knife. Cut the breads now into little bits or simply tear them with your hands. Place the bits of bread into a large mixing bowl. Next grate the paneer into the bowl using a grater. Now season with Salt, 1//2 tsp Roasted Masala, 1/4 tsp of Black pepper and add the fresh chopped coriander leaves. This is the basic mix for the INSTANT DAHI VADA. Add a little water about 1 tbsp in order to soften the bread. Now mix all the contents in the bowl with your hands so that everything in the bowl comes together like a semi soft dough. Cut out 1 inch pieces from the semi soft dough, Shapen them into round shaped balls and flatten them. I wanted small cocktail sized Dahi Vadas as I didn't want them to be too filling and allow my guests to enjoy the other fare on the table. Heat enough oil in a pan to be able to shallow fry the Vadas. Once hot pop the VADAS in the oil . Once Golden brown on one side flip them over and brown them on the other side. Just make sure that the VADAS do not stick to your pan. Take them out of the oil into a paper towel to absorb the excess oil. Heat about 2 Cups of water till Luke warm. We will plop our VADAS into this Luke warm water to make them slightly soft and also to ensure they soak in the yogurt and all its flavours later on. Let the VADAS swim in the water for a couple of minutes till they are slightly soft. I don't want it to soften too much and retain a little bit of the crunch, so two and haf to three minutes in the water in just enough. Then take them out and squeeze the excess water by gently pressing the vadas. Now it is time for the VADAS to get covered by the scrumptious pomegranate yogurt. Take yogurt in a bowl. Add Amchoor powder, roasted masala powder about 1 tsp, Chaat Masala powder, Black Salt, Fresh Chopped Coriander Leaves and lightly mix. Wow nice, amazing aromas, nice flavours, great ideas definitely to sparkle up your festive season, isn't it? Now is time. Great Yogurt done, Vadas done, now its time to cover the Vadas with the yumm yumm yummy yogurt and plate up. To plate, lay the Vadas in a line or as you wish. And then pour some yogurt over them. Place the pomegranate pearls and mint leaves randomly. Sprinkle the chopped Coriander leaves and add a dash of sweet chilli sauce over them. Add Amchoor powder, roasted masala powder about 1 tsp, Chaat Masala powder, Black Salt, Fresh Chopped Coriander Leaves and lightly mix. Wow nice, amazing aromas, nice flavours, great ideas definitely to sparkle up your festive season, isn't it? Now is the time. Great, Yogurt done, Vadas done, now its time to cover the Vadas with the yumm yumm yummy yogurt and plate up. Hope you have a blast this Holi and prepare the Instant Bread Dahi Vada to up the festive fervour.